Ted Denham passed away on July 24 of a heart attack. He was 78 years old. Ted grew up caddying with his brother Rex at Royal Oaks CC, for then-professional Harry Clow. He won the 1971 Oregon Open at Spring Hill CC – his brother Rex was the host professional that year. 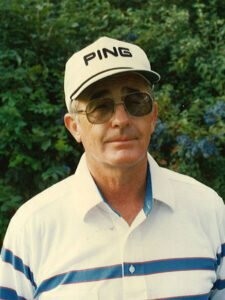 Ted also won the 1971 Pacific Northwest PGA Championship at Royal Oaks and the 1974 Assistant Professional Championship at Tacoma C&GC. Over the years, he worked at Fort Lewis GC, Tacoma C&GC, North Shore GC and Shield Crest GC. Current plans are for a memorial service to be held sometime in August. This post will be updated with details. Memorial service will be held September 10 at 1:00 PM, at New Herizon. A potluck in the gym will follow the service. The 1st annual Ted Denham memorial golf tournament will be held Sept 11 at 9:00, at Harbor Isles golf course. The price is $60.00 which will include golf with cart, food and prizes. If you are interested to sign up please contact Rex Denham at denhamdogs3@gmail.com or 7078344888. Thank you family and friends for all of your love and support during this difficult time.